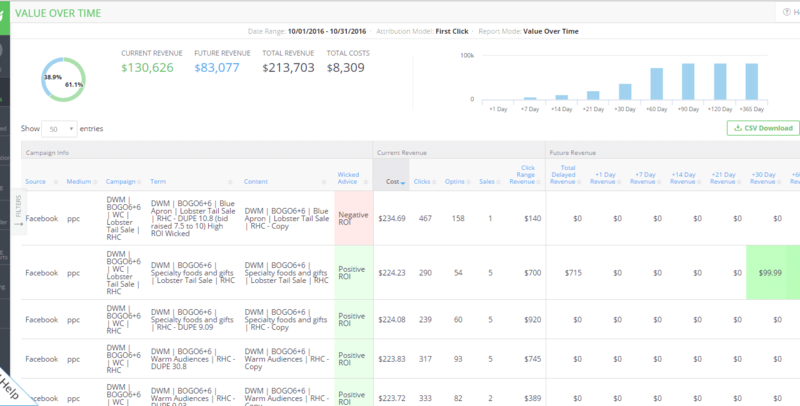 Wicked Reports offers affordable marketing analytics for your small business. With Wicked Reports, you can understand how your marketing and advertising efforts work together to produce customers and revenue. Once you understand what is (and isn’t) working, you can optimize your marketing and advertising spend to boost your positive ROI and grow your customer base faster. You’ll be able to see exactly which email campaigns are creating customers and exactly how much revenue they’re bringing in. Easy-to-understand reports and people-based tracking give you confidence that you’re coming to accurate conclusions. Wicked Reports includes 16 pre-built reports that answer the questions small businesses have such as ROI reports for Facebook, Adwords, and Social Media, buying day and time, predictive behaviors, lead value over time, sales velocity, and more. With deep, accurate insight into your marketing’s performance, you'll be able to make better business decisions, cut costs, and improve your marketing's effectiveness. Need help with integration? Check out the Wicked Reports integration documentation.